The use of red blood cell products has been shown to be highly variable, with some patients receiving transfusions that are not required. The States and Territories have safety and quality programs aimed at improving the rate of clinically appropriate transfusions, but these programs often have limited access to data on blood use drivers and trends. 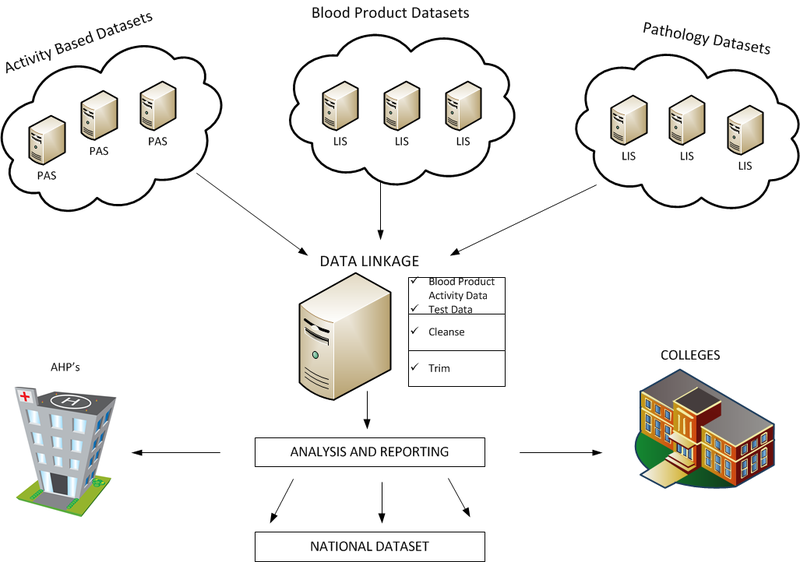 The purpose of the NBA’s National Data Linkage Project is to facilitate jurisdictional-based data linkage with the aim of producing a nationally consistent dataset of, and ultimately a national report on, blood product use in Australia. The diagram below illustrates how data linkages will be implemented (click on image to enlarge). The project is focused on providing data to answer key questions, as explained in the table below. Which specialty areas are key users of blood and blood products? How have blood use trends changed over time? - by specialty and by hospital? - by day and overnight patients? - by emergency and elective patients? - by medical and surgical patients? - by age and gender of patients? How do hospitals compare with blood use overall and by specialty? How do hospitals compare with blood use by the relevant clinical sub-groupings? Does the data show potential diversion from nationally endorsed clinical guidelines for transfusion? 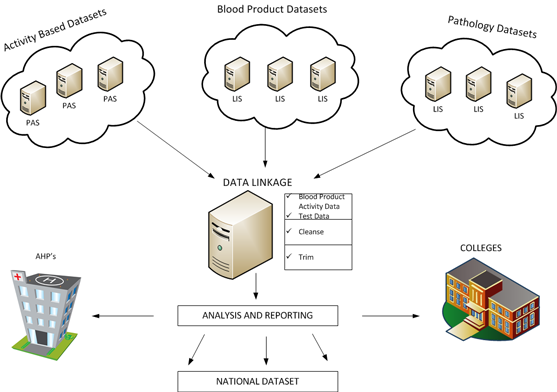 The NBA held a workshop in March 2013 to progress this project on red cell data usage. The outcomes of the workshop will be provided to governments.